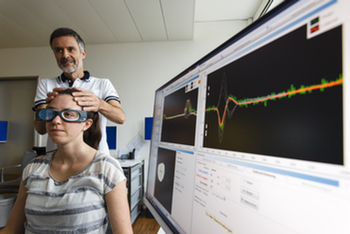 Media representatives will find all relevant information on the Swiss Concussion Center here. Please contact media@swissconcussion.com for specific media requests. The Swiss Concussion Center was founded in September 2015 by the Neurology Department of the University Hospital Zürich and the Schulthess Clinic and has institutionalized the management of sport-associated head injuries in Switzerland. The primary aim of the Swiss Concussion Center is to improve the return to routine training and competition across all types of sports, i.e. to enable a timely and safe return to their sport for the affected athletes. A further aim is the early-stage identification of athletes who are at increased risk of delayed recovery so therapeutic measures can be initiated. The Swiss Concussion Center is located at the Schulthess Clinic and focuses on the three core areas, clinic (diagnostics/therapy), research and services. In addition to the broad range of high technology diagnostic options, the Swiss Concussion Center can offer diverse multimodal therapeutic programmes and a close relationship to elite sports.